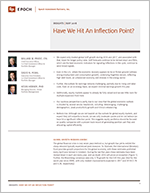 Have We Hit An Inflection Point? - Epoch Investment Partners, Inc.
Have We Hit An Inflection Point? We expect only modest global GDP growth during 2016 and 2017, and associated with that, lower-for-longer policy rates. GDP forecasts continue to be revised down and PMIs, which are the best economic indicators for signaling inflections in the cycle, continue to send mixed signals. Even in the U.S., where the economic recovery appears to be on firmer ground (witness strong employment and consumption growth), underlying fragilities remain, reflecting high debt levels, an unbalanced economy and stresses in the energy sector. Further, the outlook for earnings remains challenging, partially due to rising unit labor costs. Even on an ex-energy basis, we expect minimal earnings growth this year. Additionally, equity markets appear to already be fully valued and we see little room for multiple expansion from here. Our cautious perspective is partly due to our view that the global economic outlook is clouded by several secular headwinds, including: deleveraging, challenging demographics, weak productivity growth and China’s rebalancing. Bottom-line: Although we are not bearish on the outlook for global equity markets, and expect they will outperform bonds, we see only moderate upside and do not believe we have hit a significant inflection point. This suggests equity portfolios should be focused on quality companies with a proven track-record of generating positive cash flow and allocating capital efficiently. The global financial crisis is now seven years behind us, but growth has yet to exhibit the sharp rebound typically experienced post-recession. To illustrate, the International Monetary Fund provides growth projections for the global economy, with these estimates published every April (and revised in October). During the last five years these estimates have been revised down in each and every year, and we doubt 2016 will prove an exception (Figure 1). Further, the Bloomberg consensus sees only 2.7% growth for the G20 this year (tied for the worst year since 2009), with only modest improvements expected in 2017 and 2018 (3.1% and 3.2%, respectively). 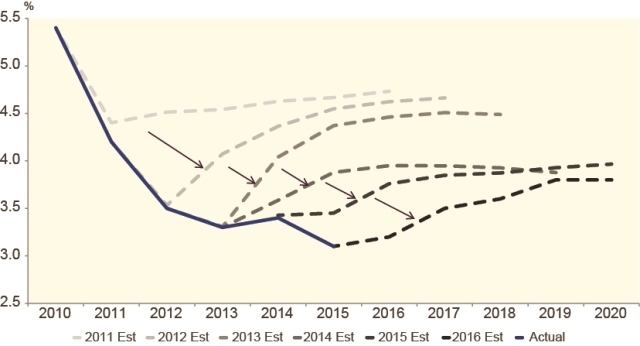 The global growth outlook has continuously been revised down. What are Leading Economic Indicators Telling Us? Another approach to tracking growth involves Purchasing Manager Indexes, which are the best economic indicators for signaling inflections in the cycle. However, they continue to send mixed signals (Figure 2). The PMI for China has improved, but it is barely in expansion territory (defined as a reading above 50), while that for the U.S. remains well below its average level over the last three years. Overall, the PMIs offer little reason to turn bullish at this point. 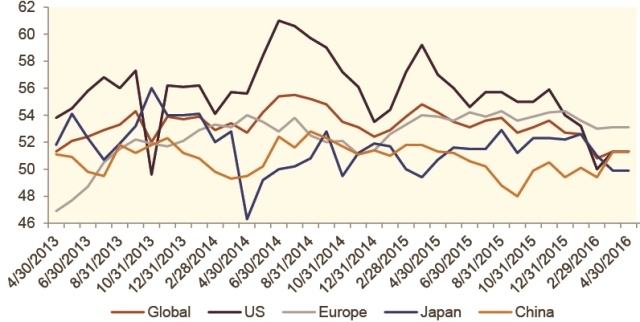 Global PMIs do not suggest we have hit an inflection point. While we are not bearish on the global growth outlook, we see only a few pockets of robust activity (e.g., India and maybe the U.S.). Although many commentators have exaggerated the likelihood of a hard landing in China, the country remains in the early innings of a long and difficult rebalancing. Growth is highly likely to continue to decelerate, which is actually a good thing, both for China and for the global economy. However, the Middle Kingdom drove 43% of global growth since 2009, so this deceleration will be felt globally. The next biggest economy is Europe, where upside risks to growth remain limited by overly tight fiscal policy and rather ineffectual monetary policy. The region remains buffeted by the fight between centrifugal and centripetal forces including: the autocratic east versus the liberal democratic west; the largely unreformed south versus the more competitive north; a host of Eurosceptic political leaders (such as Marine Le Pen); regional issues (e.g., Catalonia, socialists in Portugal and Spain, Italian banks); and, of course, the ongoing refugee crisis. The next two big economies are Japan and the U.K. The former is in a very difficult situation and Prime Minister Abe may soon be forced to implement an even more unconventional policy mix. The U.K. economy is relatively robust, but the sole focus over the next two months will be the June Brexit vote (which has a 35% chance of succeeding, an outcome that would be quite negative for economies on both sides of the channel). For brevity’s sake we will spare readers a discussion of the difficult outlook for Brazil and Russia, which are expected to “grow” by -3.6% and -1.3%, respectively, during 2016. Some investors argue that the economic outlook must be improving, otherwise the Federal Reserve would not have hiked interest rates in December and projected a further two moves in 2016. However, we believe the Fed is unlikely to hike more than once this year for reasons shown in Figures 3 and 4. 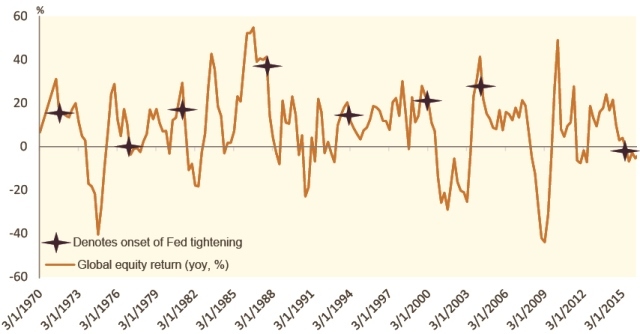 It is almost unprecedented for equity returns to be negative when the Fed begins hiking (even with the recent rally, global equities are still down 5% yoy). December marked the first time in over 50 years that the Fed commenced a hiking cycle while bond yields were trending downward. Note that it is extremely unusual for the Fed to hike when equity market returns are negative, bond yields are declining, high yield spreads are rising and commodity prices are under pressure. 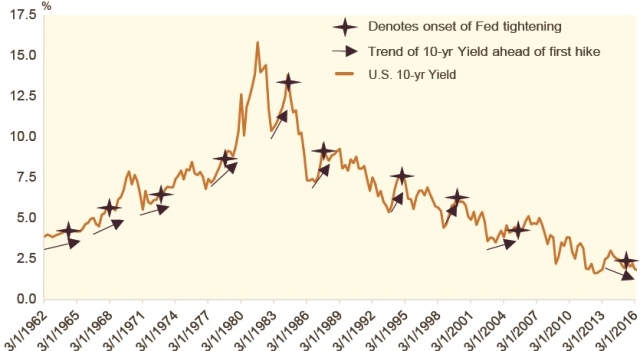 During the past 50 years, when the Fed commenced hiking it was almost always the case that equity markets were robust, credit spreads were narrowing and 10-year yields were rising. None of those conditions hold today, which suggests the risk of a policy error, as the Fed may be underestimating the fragility of the global macro environment. 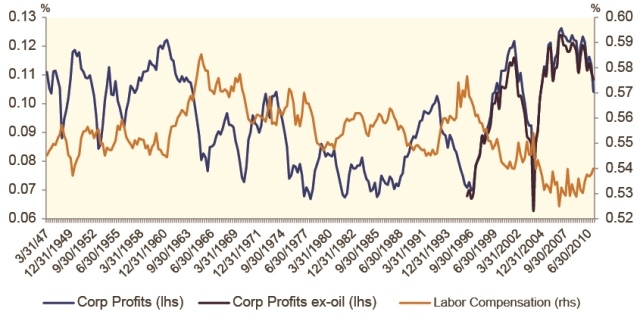 One consequence of the difficult macro backdrop is that the outlook for corporate profits is not terribly supportive (Figure 5), partially due to rising unit labor costs. Note that unit labor costs are up 3.3% (on a SAAR basis), well above the 15-year mean of 1.0%. This in turn reflects tepid productivity growth, currently running at 0.5% yoy, leagues below its 15-year average of 1.9%. Corporate profits (as a percent of GDP) have declined sharply, even excluding the oil sector, while labor compensation (also percent of GDP) is beginning to climb. As a result, S&P 500 earnings and revenue growth in Q1 of 2016 have been weak (Figure 6). This reflects multiple headwinds, including the strong U.S. dollar, weak growth outside the U.S. and a floundering energy sector. For 2016, investors only expect earnings growth of 2.7% (ex-energy), which strikes us as reasonable. However, on its own it won’t provide much of a tailwind to equity markets. Tepid earnings and revenues expectations for S&P 500 companies (ex-energy) for Q1 2016. Companies with a majority of their sales abroad are particularly hard hit (due to strong USD and anemic global growth). Additionally, exceptional items have become increasingly important, leading to a widening gap between GAAP and pro forma earnings (Figure 7). In fact, the overall gap this year for the S&P 500 was the largest observed in the last two decades, with the sole exception of 2008. The provides yet another reason not to be terribly optimistic regarding the earnings outlook. There is a widening gap between GAAP and pro forma earnings (largely due to the energy sector). Additionally, equity markets have already re-rated and we see little room for multiple expansion from here. 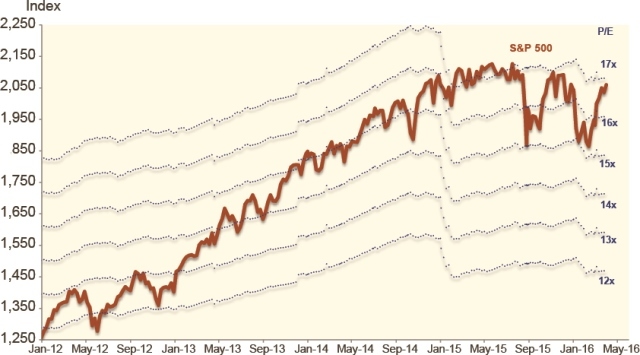 This point is illustrated by Figure 8 which shows the S&P 500’s 12-month forward P/E multiple. We won’t belabor this point, as it seems to be quite well known by now. Markets have re-rerated as a result of QE, leaving little further room for multiple expansion. Our cautious perspective is partly due to our view that the global economic outlook is clouded by several secular headwinds, including: deleveraging, challenging demographics, weak productivity growth and China’s rebalancing. For example, Robert Gordon (Northwestern University and author of the acclaimed “Rise and Fall of American Growth”) emphasizes several headwinds, including demographics and government debt, to conclude that America is riding on a slow-moving turtle. These challenges are also stressed by Larry Summers (Harvard University and former Treasury Secretary), who adds two more into the mix: we are living in a capital-light world (largely due to technological progress); and there remains a surplus of savings (alternatively, a deficiency in demand or a too low propensity to consume). Additionally, Raghuram Rajan (University of Chicago, currently governor of the Reserve Bank of India) emphasizes that emerging markets need to rework their export-led growth models, a process that has only just started. If Professors Gordon, Summers and Rajan are correct, there are several key implications for markets and investors. Most importantly, inflation will remain low for a very long time (as will bond yields). Further, unconventional policy responses are becoming increasingly conventional (please see our Insight on Negative Interest Rate Policies). Although we are not bearish on the outlook for global equity markets, we see less upside than in the typical cycle and do not believe we have hit a significant inflection point. This suggests equity portfolios should be focused on quality companies with a proven track-record of generating positive cash flow and allocating capital efficiently.